On Wednesday, the Cabinet approved the Surrogacy (Regulation) Bill 2016, a move which has evoked mixed reactions from all quarters. External Affairs Minister Smt Sushma Swaraj, led the Group of Ministers, who finalized the bill in its current form. The approval of the Bill is historic, as regulations for surrogacy are very much the need of the hour. Centre for Social Research has been one of the leading experts in the field of surrogacy in India. We have published various research reports, and been actively involved with advocacy initiatives pertaining to surrogacy. Through our studies and research in Delhi, Mumbai and Surat, we found out about the grave exploitation of surrogate mothers, and the misuse of the practice of surrogacy, in the absence of any real law or regulation on surrogacy. Let us first understand, what surrogacy is. To put it simply, when a couple is unable to have a child because either or both partners are medically not able to conceive or go through a pregnancy full term, another woman is artificially inseminated. The eggs from the mother are fertilised with the father’s/donor’s sperm and then the embryo is placed into the uterus of the surrogate, who carries the child to term and delivers it. In this case, the biological mother is still the woman whose eggs are used, while the surrogate is called the birth mother. Although certain guidelines were in place prior to the passing of the Bill, what lacked was a strong legal mechanism in place to deal with the rights of the surrogate mother. In the absence of such a law, surrogacy turned into a commercial business. This commercialization of surrogacy led to a black market and baby-selling, breeding farms, turning impoverished women into baby producers and the possibility of selective breeding at a price. As of now, the women who engage in surrogacy are usually poor. They agree to conceive on behalf of another couple in return for a sum of money that would otherwise take many years to make. It is important to understand that these women generally do not have many career prospects as they are predominately uneducated, often engaged in casual work, sometimes migrants in search of better job opportunities and living in slum areas with inadequate housing facilities. There is often a written contract between the concerned parties in a surrogacy situation, but due to majority of surrogate mothers being illiterate and poor, they often don’t know of the exact nature of these contracts and many times don’t possess a copy of the contract. Compensation is not fixed, and is arbitrarily decided by clinics. There is no attention given to the physical and mental health condition of the surrogate mother. Additionally, there is a lot of stigma pertaining to being a surrogate mother, and many times these women are ostracized by their husbands and families for this decision of theirs. These are just some of the problems which CSR encountered during the research process, and as a result, along with several legal, medical and academic experts, came out with a policy document, with several recommendations for the government to incorporate in a legal framework, to protect the interests of all parties involved, including the surrogate mother. Now let’s focus on the Bill and its key features. As per the Bill, surrogacy is only allowed for couples married for at least five years, and the surrogate mother must be a close relative of the couple, who should be married, with at least one biological child. Childless or unmarried women cannot be surrogate mothers. As of now, the Bill bans commercial surrogacy (i.e. hiring a womb), and bars married couples who have biological or adopted children, single people, live-in partners and homosexuals from opting for surrogacy. Similarly, foreign nationals, NRIs and Persons of Indian Origin holding an Overseas Citizen of India status, are also barred from opting for surrogacy. This move is in line with the Government’s efforts to encourage adoption. Another key aspect of the Bill is that it requires all surrogacy clinics to be registered. Clinics can charge for the services rendered in the course of surrogacy, but the surrogate mother cannot be paid. 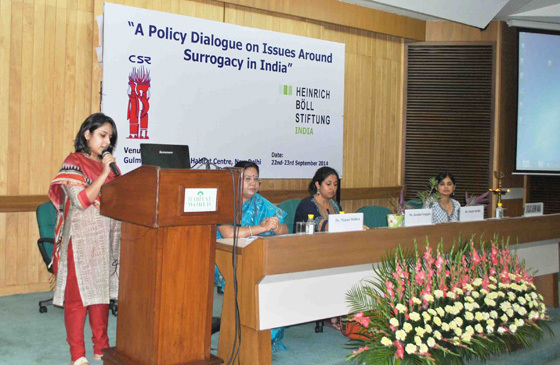 National and state surrogacy boards will be the regulating authorities. The penalties and punishments are also strict. Abandonment of surrogate child, commercial surrogacy, and exploitation of surrogate mother, selling of human embryo or import of embryo will attract imprisonment of at least 10 years and a fine of up to Rs 10 lakh. Violation of any other provision shall be punishable with imprisonment for at least 5 years and a fine of up to Rs 10 lakh. Surrogacy is a very sensitive issue with medical, legal, social and cultural ramifications for society as we know it. Without proper regulation so far, many surrogate mothers have been exploited, and surrogate children have been abandoned. With this Bill in place, we hope that these incidents are curbed, and the process of surrogacy is regularized and restricted to genuine cases. What Schemes Does Modi Ji Have for Women in the Next Budget? Previous story Banning the Burkini- Solution to Terrorism?